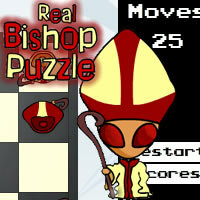 Real Bishop Puzzle appears to be a simple puzzle game. You have a compact 5x4 chess board with four white bishops placed in the top line and four red bishops in the bottom line. Bishops only move diagonally and you cannot place them on a square where can be captured. Respecting this, your objective is to switch the positions of red and white bishops. This game is based in one of most difficult puzzles of the game The 7th Guest, released in the early 90’s for PC.